I am constantly amazed at how often people ask me, “Why can’t any bank or broker with a large budget hire a bunch of engineers and easily replicate Wealthfront?” The answer is simple: not all software is created equal. If it were, you probably wouldn’t be doing all your searches on Google and buying most things from Amazon. We believe our software is simply better than our competitors’. A great example of our superior software is tax-loss harvesting, an important feature Wealthfront pioneered in October 2012. The goal of our daily tax-loss harvesting service is to minimize investment taxes for our clients. The service does this by selling securities that are trading at a loss and replacing them with highly correlated securities, so you maintain the expected risk and return profile of your portfolio. Harvested losses can be used to lower your tax bill by offsetting long- and short-term capital gains in your investment accounts (including accounts outside of Wealthfront). Moreover, the tax code allows you to use $3,000 of losses to reduce ordinary income when the harvested losses exceed the capital gain amounts, with the remaining loss amount carried forward indefinitely. When we shipped daily tax-loss harvesting, no one paid it much attention even though our research showed it could offer far more value than the substantial fees we save our clients (for more details please see Investment Fees Matter, But Taxes Matter Even More). It took more than a year and a half before any of our competitors were able to offer their own version of tax-loss harvesting, and as of this post, more than four years after our innovation, only 6 out of the 11 automated investment services offer even some form of tax-loss harvesting. Although tax-loss harvesting is now acknowledged to be of great value, almost every article I read about automated investment services simply treats it as a checkbox item – a simple “do you have it or not?” After all, “it’s just software.” It’s shocking to me that people assume there are no differences among the various implementations. After spending two years without success trying to get an analyst or trade journal to do a competitive analysis on tax-loss harvesting, we finally decided to run an experiment ourselves this spring. We invested $100,000 each in Wealthfront and Schwab Intelligent Portfolios taxable accounts with comparable risk tolerances on April 1, 2016. We chose to invest $100,000 because Schwab has a $50,000 minimum for its tax-loss harvesting service (vs. $500 for Wealthfront) and we wanted a nice round number to make the results easier to understand. Even we were shocked by the outcome. As you can see Schwab didn’t harvest any losses – not one dollar – in a period that had tremendous volatility including the huge downdraft from the Brexit results. And as I said before tax-loss harvesting generates most of its value when markets are volatile. 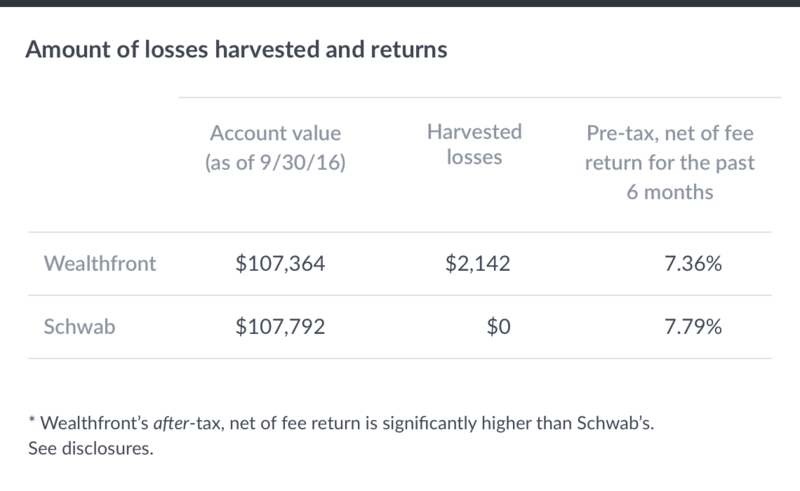 You may notice that Schwab generated a higher short-term pre-tax net of fee return than Wealthfront. As we have explained in numerous blog posts, Wealthfront is focused on maximizing after-tax returns, not pre-tax returns. We did not publish an after-tax net of fee return because it is dependent on the reader’s income, state of residence and amount of realized short and long-term capital gains. Wealthfront’s after tax, net of fee return should be significantly better than Schwab’s due to Wealthfront’s superior tax-loss harvesting (even if just applied against ordinary income), its use of more tax efficient asset classes (namely tax exempt bonds rather than corporate bonds and the exclusion of real estate) and more tax efficient rebalancing. This raises a very obvious and very big question. How can Schwab claim they offer effective tax-loss harvesting when we have proof that they did not harvest any losses during a period of substantial volatility? That’s hard to answer because Schwab never specifically details how their tax-loss harvesting service works in their whitepaper on the subject. In our view most of the large incumbents in financial services don’t compete on the quality of their offerings, especially their software. Instead they rely on their sheer size and hefty advertising budgets to maintain a competitive advantage. If anything they think of software development as an expense center, one they want to minimize as much as possible in the interests of a better bottom line. They’re satisfied if their software is “good enough” to allow them to check the box that they offer a particular feature. But as we’ve shown with tax-loss harvesting, treating software as an afterthought is very bad for the financial health of your clients. If your tax-loss harvesting software can’t generate savings even during a highly volatile period like Brexit, then you probably shouldn’t be able to claim to offer the service. Our initial service – a periodically rebalanced, diversified portfolio of low cost index funds – was not terribly sophisticated, but our value added was making it easy to use and inexpensive. I used to kiddingly say that we added very little value and priced our service accordingly. It was so simple that most people assumed that’s all software could do. Over the past five years we have invested in the development of software that can dramatically improve our clients’ after tax returns and begun to provide financial advice that was previously only available through expensive advisors. But many people still think we only offer a basic diversified portfolio of index funds. The beauty of software is how it improves over time. So competing with a technology leader is like trying to catch a moving target. Schwab introduced its automated investment service three years after we launched our first service – and guess what? It didn’t even do what we did three years prior. However, the real differentiator is not the ever widening gap in features, but the now measurable gap in financial results to clients. There is a tremendous advantage to being the creator of a new software feature. It affords you the unique opportunity to observe how real clients use your software so you can make subtle improvements that are seldom apparent. Competitors who attempt to clone your product can only copy what they can see. We are now on the fourth generation of our tax-loss harvesting service while most of our competitors are still on their first generation service, and as you see from our results, it shows. The most important thing you need to remember when evaluating software-based financial advisors is that all software is NOT created equal. In fact, some of it doesn’t seem to do anything at all. Past performance does not guarantee future results. Performance information is presented net of all management fees and expenses. For all periods the performance information includes the reinvestment of dividends and interest unless otherwise noted. A client may also request that Wealthfront monitor the client’s spouse’s accounts or their IRA accounts at Wealthfront to avoid the wash sale disallowance rule. A client may request spousal monitoring online or by calling Wealthfront at (650) 249-4250. If Wealthfront is monitoring multiple accounts to avoid the wash sale disallowance rule, the first taxable account to trade a security will block the other account(s) from trading in that same security for 30 days.